This wasn't supposed to be an especially memorable night out, just a few guys hanging out, drinking wine. But there was a thirty-four year old Rioja Zacki and I wanted to check out, a dark horse if there ever was one: a little known bodega none of us had ever tasted and the label was only a Reserva (so not only was the provenance questionable, but you can rest assured there were few online reports on the wine available). And then Zacki brought a Grenache from a small boutique in a Spanish D.O. none of us had ever heard of, and that worried him enough to open his backup bottle, a Chablis from a producer who is arguably the best Chablis you can actually buy in Israel. We had an Ente, a producer of such minuscule quantities that any bottle shared is a rare treat indeed, then a wine from the twilight days of Avi Feldstein's association with Barkan (the operations has since collapsed under the weight of managerial dictates and the sheer tonnage of grapes and sluice into a sort of Dark Age). Finally, we capped the night with another rare treat, a vintage Sherry, after which the four of us somehow managed to totter home. In the immortal words of Nero Wolfe: "quite satisfactory". Complex, old world aromas of tea, spices, the fruit red, shifting subtly to black. The palate still kicks and thrives and improves and grows with time. We had enough to liquid to re-visit over three hours and the wine showed no signs of weakening. This is what you get when the tannins have integrated so well that resultant nectar is unadulterated mellow sweetness of the fruit and warm, confident savoriness of age. This cost 107 USD at K and L Wines. Add shipping and having had to wait over a year until it was delivered to my sister-in-law and finally couriered to Israel - and it's still worth the money and time. Jancis Robinson seems to like Landi more than I do, but I realize it was too alcoholic for the setting and up against fiercely elegant competition. This is pure Grenache, but it has an autumnal, leafy character not unlike a Côte de Beaune, with a hint of licorice as well. It also has this funky aspect to it, but in a clean way, like the sweat of a healthy horse, as opposed to the droppings of a sick one (in other words, the non-spore forming genus of yeast in the family Saccharomycetaceae often colloquially referred to as "Brett"). This is in a tight embryonic stage, where what you get is lime and rocks and not that marine, fossil Chablis thing, so I'd wait a year for it to come out of its shell (pun half-intended). It's lean, yet dense with fruit, a combination only great Burgundy producers can conjure. You can get lean or you can get dense, you can get a halfway point - most of the time, most of the rest of the world, you just can't get both. Bourgogne Crown, 145 NIS. Amazing quality for the price. 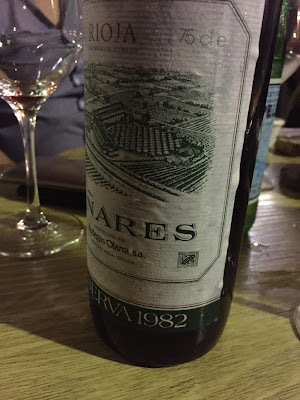 Avi was going to run a mini-boutique secreted away within Barkan-Segal and Arka was one of the wines he was crafting. This has Cab, Syrah, Avi's pet Argaman and maybe some others I missed when Yotam was reading out the label. It's just on the edge of over ripeness, but there is very good acidity that balances that, and it shows Avi's trademark mix of muscle and elegance. Price irrelevant. It was never sold commercially and Barkan, in an absurd fit of corporate lunacy, shut down the operation. Ente is such a fantastic producer that I'm tempted to write a tasting note punctuated only exclamation points. The fresh, lime acidity is almost startlingly vibrant and highlights that Bourgogne sparkle of apples, flint and dry grass. Ente is a great one, indeed, and it's hard to believe the domaine is only seven years old. I used to drink a lot of sherry, 10-12 years ago. I moved on, but every now and then a bottle of Lustau tempts me at Fortum and Mason. This tempted me for two reasons. One - the pound was very low following Brexit, and, two - I've never had a vintage sherry, which is a very rare creature. This is typically fragrant with a combination of olives, cured meat and toasted nuts, layered with dusty/briny notes, with the pungent/sweet finish that is a taste I'm glad to have acquired, even if I only indulge it once every couple of years.